The news that Walter Smith has returned to Ibrox as a non-executive director has been greeted with a sense of joy and excitement normally only witnessed when a quality new signing is added to the ranks. Obviously due to the fact the Gers still have just over a year before the transfer embargo passes any fresh faces will be seen in the boardroom and not on the park, which may have in the past been not something Bears would pay any interest too. But as the club continues on the long winding road back to the top movement at a directorial level should be carefully scrutinised. Cynics would suggest the arrival of Smith is a publicity stunt by Charles Green as he continues to try and win over the support in the build up to the IPO. But Green appears to have already convinced the vast majority of the fan base his intentions are true, whilst Walter Smith is not niave and simply not the type of person who can be used as a pawn. After early misgivings and doubts which saw him linking up Jim McColl and Donald Park Walter has clearly been won over by the Green consortium, and hopefully the boost of his third stint at the Gers will inject more positivity at the club and amongst the support. The sight of Walter at matches in the directors box alone should be all the confirmation required that after a summer of bitter infighting the Rangers family are beginning again to unite, not simply in defiance, but in a spirit of loyalty and determination to ensure the rebirth of the blues will not be a false dawn. Just as important is the fact that Walter has quashed any speculation that his return should not mean that Ally McCoist will be anxiously looking over his shoulders in the worry that if he struggles with his own job a ready made replacement will be able to smoothly transfer from the boardroom back to the dug out. Although surely no one is foolish enough to dismiss the notion of Ally seeking advice and guidance from the man who was his mentor for a number of years. Indeed the current Rangers gaffer has already spoken of his semi-regular contact with Walter before his return on the weekend, and it would be poor judgement of his if Ally had opted not to utilise the old grey fox's vast experience. For those of us not steeped in the business world, a non-executive director is someone who is not part of the executive management team but whose opinions and contacts are seen as valuable in the day to day running of the business. 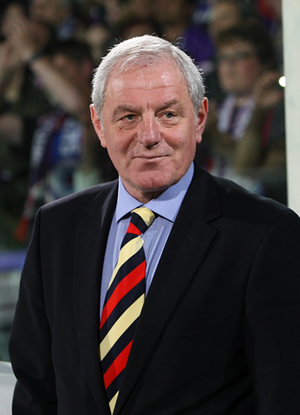 So as talk of further, and much needed, reformation of the Scottish Football Association and Scottish Premier League intensifies having Walter Smith back on board does nothing but to enhance the reputation of the new-look Gers, giving them more muscle and respect. And as prospective new sponsorship and lucrative marketing deals are investigated to help inject more funds into the club having the name of Walter Smith being associated once again will no doubt be a real asset to Charles Green and co.
Green has been a breath of fresh air: He says what he thinks and his thinking has definitely be on the same level for many Bears who have expressed a real desire that someone starts to speak up for the club at a time when it appeared they were everyone’s favourite whipping boys after inheriting the mess left by Craig Whyte. He has lived to his promises and continues to deliver and having won over both Ally McCoist and Walter Smith, two men who know the club inside out, Charles Green could well one day be held in the same high esteem as some of the men who have rebuilt the club after troubled times such as Willie Waddell and David Holmes.